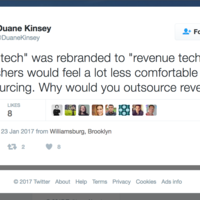 Revenue tech is here to stay. Strap yourselves in, 2017 is just getting started. Like your browser history privacy? It may be up for grabs. It's easy to blame advertising on the whole but the reality is that a lot of companies currently stand out from the crowd. Missing Ad Dollars, Whitelists, and VR. What Are Publishers Doing To Connect Advertisers With Their Audiences?